These photos were taken minutes before I threw on three pairs of sunglasses to gawk at yesterday's solar eclipse. Did you guys happen to catch it? Beautiful outfit Krystal! You always look so polished and pulled together! Love the outfits with white blazer, especially when they are combined with bright colorful pieces like this dress! this dress is amazing! i love this! I love the bow detail on the back of your shoes! SO lovely! Love the shoes! They are so fabulous!! The dress is great on you! That dress is an absolute gem! Wish I could have seen the eclipse! i didn't catch the eclipse =( i love that zara dress on you! i bought the floral print in the same style but it just didn't lay right on me. or maybe it did and i just don't look right with a full tulip skirt? you look gorgeous girl! Those shoes have the best detail-I love the bow on the back! Works perfectly with this lovely, whimsical ensemble. What an amazing, incredible look! I love the lighting with this outfit so much! You look so dreamy and gorgeous, and I am obsessed with the shoes gf!! You look feminine and sophisticated! Those shoes are soooooo cute! your dress is absolutely amazing and your heels; aah so cute! the jacket and shoes are lovely but that gorgeous print on the dress eclipses them both! No, I did not watch it, but saw the pictures.. truly stunning! I love those droopy bows. And the dress! The print on the dress is very cool, definitely unique. So bright & summery! I love that Zara dress. LOVE your heels! And the dress looks great on you! The eclipse was the most beautiful thing ever! I tried on this dress at Zara yesterday and now I am in love! love this dress! and the eclipse was so cool! ADORABLE! Love the yellow accessories! Affordable clothes where trendy meets bohemian! Shop Godis, Mix and match your own style! 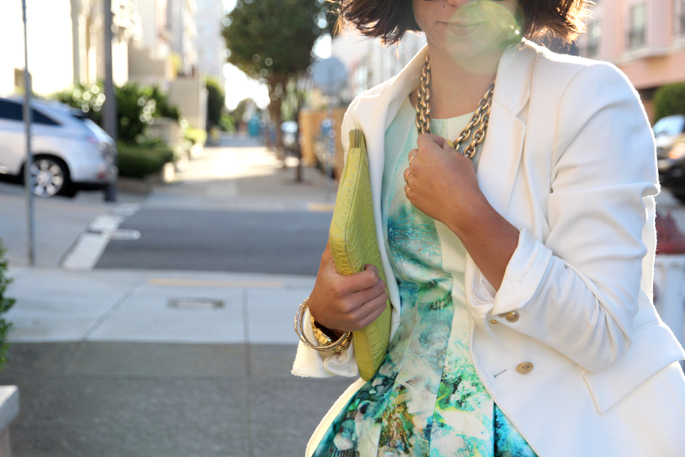 ocean print dress + drool worthy shoes = perfection! The bow detailing on your shoes is so dainty, goes well with the dress.. fabulous pairing! What is there not to love about this outfit!! The beautiful colors of the dress, the refreshing colored shoes and the white blazer that ties all together... masterfully gathered and wonderfully worn! LOVE! Please check out my new blog and let me know what you think. Hope you like and decide to follow! Thank you so very much! You look marvelous! (apologies to Billy Crystal) Love the shoes especially. The whole look just flows from one element to the next.